One of the problems plaguing traders in recent years has been that whilst markets may be trending, volatility within the trend has made it difficult to maintain positions for the duration of the move. This back and fill ‘chop’ is becoming increasingly problematic for ‘traditional’ trend following traders across every time. Forex markets tend to correlate very closely with one another. This means when one pair is exhibiting trend-less behaviour, it is likely other pairs will be doing the same. Diversification can be increased by trading some of the cross-rates, however correlation is still an issue. Below is the combined performance trading ‘one lot’ currency futures per trade which includes $20 combined commission and slippage per lot. Although the strategy is profitable performance through the entire 12 year period is very choppy. Huge draw downs are the norm: there are four years ‘under water’ between 2004-2008 and a very low Profit Factor of just 1.09. It’s important to note that performance is decent through the market crashes of 2000 and latter half of 2008, so there are certainly advantages to including trend following in a trading program for ‘fat tail’ risk protection, however it is our view that trend following is most definitely not a viable stand alone solution for professional money managers. 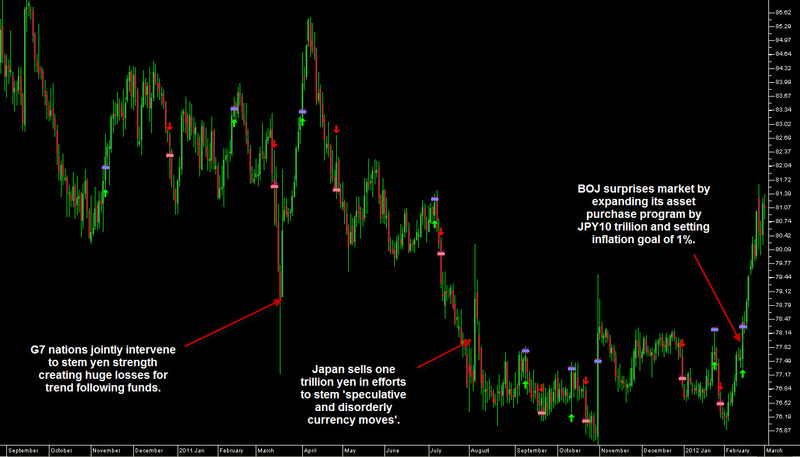 Taking a look at the chart of USD.JPY below it becomes immediately apparent why trend following traders are suffering in today’s market ‘chop’. Note how correlated market losses are with the ‘Intervention’ and Government policy announcement days. These intervention activities are wreaking havoc with traditional momentum driven trading strategies. We find it interesting that despite these results, most professional managed Forex funds still rely on trend following and momentum driven strategies for the bulk of their trading returns. Our research and results prove the best risk adjusted returns available to Forex Traders are through inter-market analysis based on Global Market Relationships. Above is the Intraday Intermarket Component of our Forex Signals Program which trades exclusively on GBP.USD using one correlated Intermarket input. Intermarket Analysis: The analysis of more than one related asset class or financial market to determine the strength or weakness of the market being considered. Instead of looking at the Forex markets on an individual basis, we use Intermarket Analysis to study the relationship of correlated markets and asset classes such as stocks, bonds and commodities as the basis of our trading decision making process. This approach differs radically from what 99% of other Forex traders are looking at. All markets are connected, both domestically and globally. A market never moves in isolation. An analysis of one market must include an analysis of all the markets. The four main market groups are the stock, bond, commodities, and currency markets. By employing Intermarket Analysis we allow market correlations to work ‘for us’ and not ‘against us’. The tighter the correlations become, the greater we can profit. We are the direct beneficiary of an increase in market correlations: the same correlations that cause pain and misery for 95% of other traders in the markets today. 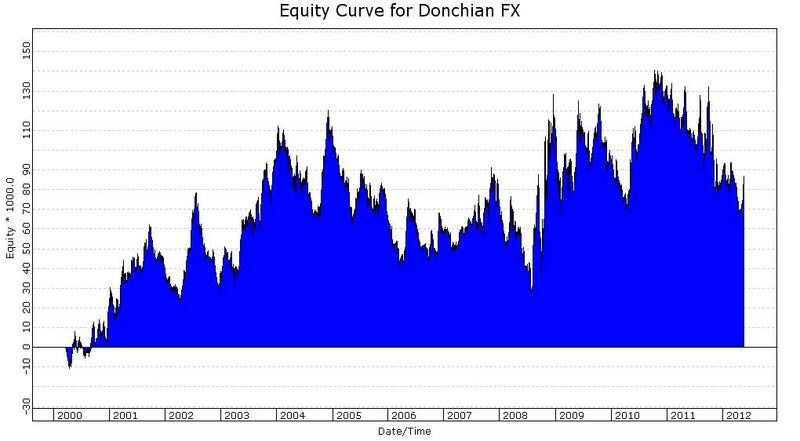 Note that while market correlations continue to increase, the equity curve and specifically the underwater equity curve correlations from our trading program remain very low. The table below shows recent weekly and monthly underwater equity correlations from our combined systems: trend following (1), Intermarket Daily (2) and Intraday Intermarket (3). 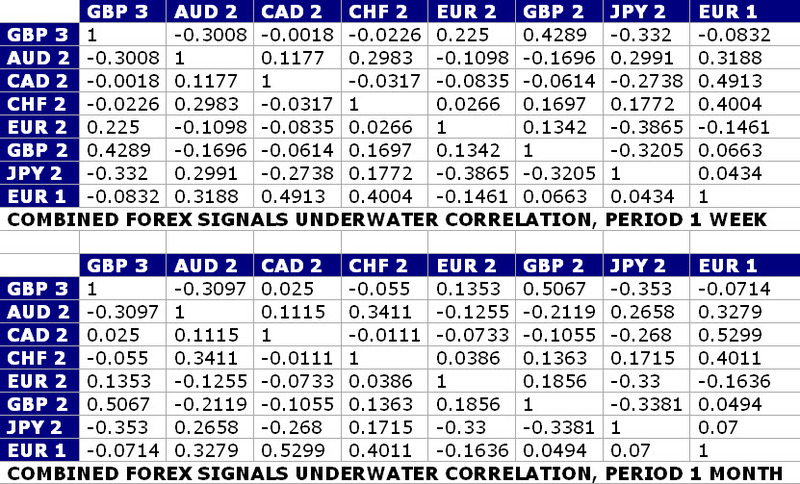 These correlations are incredibly low for Forex market trading, most notably so on the euro and Swiss franc. Because we are using two different trade inputs (intermarkets), we are able to create diversification on two of the most highly correlated currencies! Below is the combined Performance of all System Signals in our Forex Signals Program (net profit 1 lot per trade) which trade across all major Forex pairs: EUR, GBP, CHF, JPY, AUD and CAD. Note how downside volatility in equity is significantly reduced through the implementation of multi time frame systems and markets. So to summarize: in order to succeed in trading you need a proven trading edge, one that works now and that is adaptive to market change. To build an edge, since 90% of market participants FAIL, you must be trading different strategies which have been designed to capitalize on the failure of others. Intermarket trading combined with robust trend following volatility breakouts for fat tail protection successfully achieves this objective. To learn more about trading with a Statistically Proven Advantage in the Forex markets get started today on a Risk-Free Test Drive of our Forex Signals Program. You can try it for 7 days and see the results for yourself. You can cancel at the end of the trial and get a full refund if you wish, or continue and get the trading education and support you’ll need to succeed.